This latest collection of Robert Penn Warren's poems give more evidence of his deficiencies--his affection for abstractions, like God, Truth, and Time, and his passion for the rhetorical question--than of his strengths. Instead of defining experience within the poem, he more often than not asks what it is or why it is indefinable. "Alone, alone,/ What grandeur here speaks? . . . What,/ Long ago, did the world try to say? "; "Why have I wandered the asphalt of midnight and not known why? "; "What kind of world is this we walk in?" "Lesson in History," no lesson, is nothing but rhetorical questions ("Why did Boone at sunset sing?" "What did Hudson see on that last night?" "What did Anne Boleyn think as the ax rose?"). Either Warren wishes to suggest the Mystery of Everything without further responsibility for penetrating it, or he's developed a bad habit from a lingering refusal to accept the finite world. 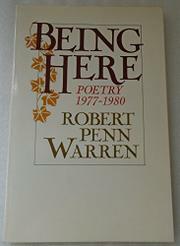 None of the poems in these pages approaches the few definitive poems Warren wrote years ago: "Notes on a Life to be Lived" (1966), "Bearded Oaks" (1942), or "History" (1935). Nor are there a dozen lines that pose cosmic questions about private destiny with as grand a flourish as the opening paragraph of his period novel, World Enough and Time (1950).